During the month of February we, at Starfish Social Club, are working on conversation skills. Engaging in a successful conversation is a pretty complex process with lots of moving pieces. Students with social learning challenges may struggle with conversational skills for multiple reasons. 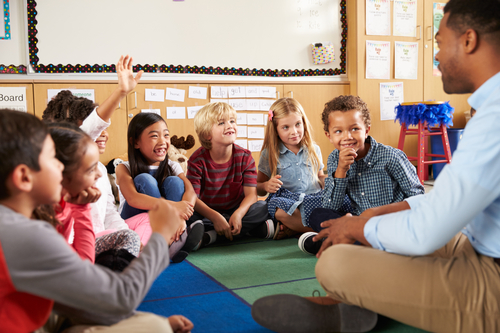 Students who struggle with interpreting social cues may have a difficult time knowing when to change the topic or when they’ve talked too long. Those who struggle with considering the wants/needs of others may be challenged with choosing appropriate topics for the audience. Slower processing speed may make keeping up with the pace of conversations difficult. Lack of cognitive flexibility may cause topic changes and different opinions to be a challenge. These skills require explicit instruction due to the social awareness factors that are a core part of each. I am listing the skills here in the order in which I feel they are easiest and most logical to teach. This is the first half of a two-part post. Listen to the the podcast episode of this blog! This is one of those skills I put in the category of ‘a little skill that makes a big difference’. I am choosing to put this first on the list because even students who struggle with communication will benefit from developing awareness of this skill. We typically teach and expect that during a conversation, our body is facing the person who is talking (when appropriate) and we are looking at them. The social expectation is that you stop attending to other things while someone is talking to you. This is often mentioned as a foundation of good communication. But if you are having a conversation in the context of an activity, that isn’t realistic. I wouldn’t expect a child to stop playing with her car to give her full attention to a peer while they are talking about their cars. Nor would I expect someone to stop looking at a comic book while he is having a conversation with someone about that book. If you are talking about something on your phone, it would be strange for you to put your phone down to talk about it. If the only activity happening is the conversation itself, it is appropriate to expect the other person’s attention. But if the conversation is about or related to an activity we are currently engaging in, it would be awkward to stop doing what we are talking about just to talk about it. Our middle and high school students practice small talk each week. During this time we talk about body language expectations because that’s the only task at that time. It’s uncomfortable to try to have a conversation with someone who is walking around the room or has their back to you or their head on the table. But the remainder of the time we don’t have this same expectation as we are chatting while we are working on activities, reading stories, or playing games. Students with social learning challenges are sometimes used to ‘downloading’ information. This refers to talking ‘at’ someone instead of talking ‘with’ someone. While this may be misinterpreted as having a conversation, we wouldn’t tolerate that very well from someone we didn’t love! It requires talking about something that everyone involved can engage in. A conversation requires your response being contingent upon what the other person/people just said. Having a conversation means being mindful of how long you have been speaking and the interest level of the group. Conversation skills require the cognitive flexibility to allow for topic changes and different thoughts and interests. One aspect of reciprocity has to do with length of turn. This goes both ways: short responses cause the partner/group to think you aren’t interested whereas long responses tend to cause the partner/group to lose interest. I love to role play this with students. It’s easy for them to identify me speaking for too long or giving really short answers, and they are then usually able to identify it in themselves afterwards. Another option is to show short video clips. Animated clips tend to use over-exaggerated reactions so they are amusing and make the point at the same time. Another aspect involves topic choice. While a noted characteristic of autism is restricted interests, we all have restricted interests! I’ll talk about the San Antonio Spurs for days, but will politely excuse myself from a conversation about football. I love talking about anything related to animals but conversations about technology are usually over my head. Chronologically speaking, it would seem logical to talk about initiating a conversation before joining a conversation. But initiating is a more difficult skill and requires a greater level of awareness and confidence than the ability to join a conversation. It is much easier and safer for students to join a conversation that someone else has put the work into starting than to try their own luck at it. In addition, you can easily join a conversation by only saying one or two things, then back out again. There typically isn’t a commitment expectation. *Note: It is easiest to work on this skill with as few conversational partners as possible. The complexity level rises each time another person is added into the mix. Ideally, start with two people having a conversation and gradually add more as the student demonstrates the skills successfully. Students are sometimes taught to join a conversation by going up to the group and saying ‘hi’. Imagine if you were having a group conversation at work or at an event and someone walked up and just said, “Hi!” Not only would that interrupt the conversation, it would be awkward for everyone involved. In order to have a chance at successfully joining a conversation, the joiner has to know what the conversation is about. The point of joining is to be part of the discussion, not just to be part of the group. Ideally the joiner will take a minute to listen before deciding to join. If they are comfortable with and knowledgeable about the topic, the next step is to move their body toward the group if they are not already in proximity. or the conversation is nearing an end and the group is disbanding. If students are talking about an event they went to over the weekend, it may not be appropriate for someone who wasn’t there to try to join that conversation. Two students talking about their parents being divorced may not be an appropriate conversation for another student to try to join. If the group makes room for the joiner by moving their bodies, that person has been accepted. It is now up to the joiner to make a related comment. It is not usually recommended for joiners to ask questions until after they have made a few comments as that tends to stall the conversation (or may be something that has already been discussed) and may lead to the joiner being rejected from the group. Our second post about conversation skills will be posted later this month! We will cover initiating conversations, ending conversations, and picking up on social clues.